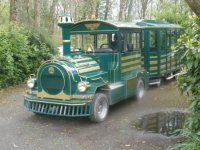 Another recent development at Portmeirion is the new woodland land train, which takes visitors free of charge on a ride into the woodland (from the tollbooth to the oriental bridge/lake and back via Salutation) behind the village. Originally 3 carriages long but reduced to 2, the service (which is not noisy) has proved popular amongst day visitors since the service began. Despite the advantages to those who normally find it difficult to go into the woods (although the very bumpy ride would still be unsuitable for those with arthritic conditions), the train has received some criticism on Portmeirion's facebook page with comments such as "looks more like Disney" and "perfect peace shattered" being posted, along with concerns about its viability, need, and effect on the woodland environment. Click HERE for more images and updates.